One of the coolest movie moments of the 80’s was when Marty McFly strapped on a pair of self-lacing Nikes in Back to the Future Part II. The futuristic Hi-Tops were a far cry from the Air Jordan IV’s that “Buggin Out” was rocking in Do The Right Thing. Had Nike actually decided to put out a line of “Marty McFly’s 22 years ago, they would have surely been the hottest footwear on the planet. Alas, self-lacing tennis shoes were still the stuff of science fiction films back in 1989. Aliens fans were indeed lucky. The Reebok “Alien Stompers” that Ellen Ripley sported were actually available to the general public (albeit in limited quantities) back in 1987. Well, it seems that the future as envisioned by Robert Zemeckis is finally here, or at least a part of it. 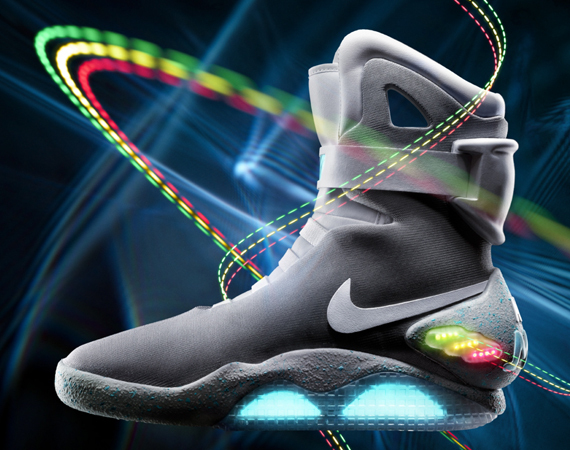 Today, Nike officially unveiled the “Air Mag” shoes sported by Marty McFly. The glowing, rechargeable Hi-Top sneakers are an exact replica of the ones that appeared in the film. They glow for up to five hours with the mere pinch of an ear. 1500 pairs will be auctioned off over at eBay starting at 8:30pm PST on September 8 and continue until September 18th. The proceeds will be going directly to the Michael J Fox foundation. If I had the money, I’d cop a pair of these in every flavor imaginable and I know I’m not alone on that. Who needs Air Max Goadomes when Nike has self-lacing kicks available? If they come out with a scuff and stain proof variant, consumers will never have to buy another pair of sneakers again. It’ll be like a television remote. All people will have to do is replace the battery every so often. I know I’m dreaming, but dreams offer a comfortable respite from today’s reality. Movies make those dreams seem all the more real. None of us may ever drive a time traveling DeLorean, but we can now dress like Marty McFly. Thanks to Nice Kicks for the scoop. Mikhail Baryshnikov, the identify needs tiny introduction; he has been the single most skilled ballroom dancers in recent history and possesses recently been a Movado Ambassador because '04. Wynton Marsalis, spruce trumpeter as well replica MontBlanc watches as Swiss Replica Watches UK Grammy award winner, is actually Movado's longest-running spokesmen being with all the brand since 98. Now, right cheap replica handbags here appear your runners: football super star Pete Sampras, hockey participant Derek Jeter along with basketball Quarterback Betty Brady replica Breitling watches are typical Movado spokesmen whom symbolize the best replica Patek Philippe watches brand's far more fantastic series like the Movado String 400 along with its mens luxury collection such as the ESQ.